The Farm Bill making its way through Congress is important to everyone living and working in Louisiana because it provides critical support to a pillar of our state’s economy: international trade. 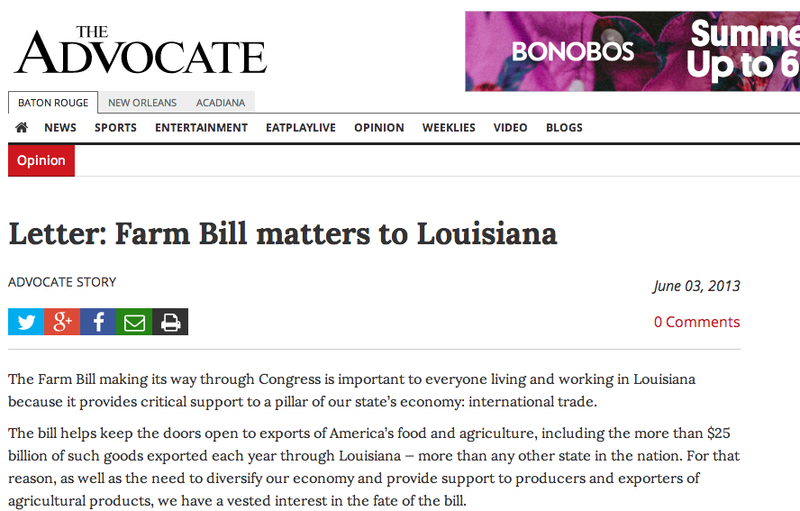 The bill helps keep the doors open to exports of America’s food and agriculture, including the more than $25 billion of such goods exported each year through Louisiana — more than any other state in the nation. For that reason, as well as the need to diversify our economy and provide support to producers and exporters of agricultural products, we have a vested interest in the fate of the bill. Many countries want to shut out our imports by technical or regulatory fiat, and our competitors are outspending us to win foreign consumers. Without funding for “boots on the ground” to keep the regulatory doors open and vie for consumer demand, we’ll lose export markets to competitors such as Europe, Brazil and Australia. Considering that one of every three acres planted in the United States is destined for foreign markets, being cut off from these markets would be disastrous not only to the U.S. economy but also to the billions of people around the world that rely on the United States for nutrition. America’s agricultural sector has been a bright spot in the U.S. economy, with exports rising more than 50 percent in the past five years. We exported a record $141 billion last year, and global demand will continue to rise, particularly among growing middle classes that recognize our products for their quality and safety. Many of the Louisiana spices and foods we see at our local grocery stores also can be found on grocery shelves around the world — items familiar to us but unfamiliar places like Hanoi, Hannover, Dubai and Dublin. Agriculture trade is deeply rooted in our state’s history and it continues to be a driver of Louisiana’s economy. Today, the food and agriculture that makes its way downriver and through our state reach over a billion consumers globally, resulting in thousands of direct and indirect jobs that reach beyond our ports and farmlands to local banks, law firms and transport businesses. These high-paying jobs, unlike the goods they will handle, cannot be exported to other countries. Due to a rising world population and an increasing ability to afford higher quality foods, global food and agriculture demand is expected to double by the year 2050. We here in Louisiana are strategically located to continue taking advantage of this trend. So whether you call it a moral responsibility, a business opportunity, or the fuel that feeds a critical component of our local economy, the Farm Bill matters.